Find us via our banner on demonstrations. 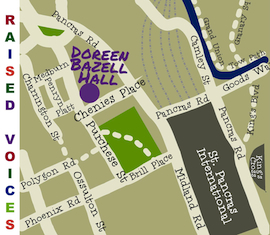 Raised Voices is a political choir based in North London. We sing for peace, justice and the environment, against militarism, capitalism, racism and sexism. We also sing to raise money for various campaigns, at political events and on demonstrations, often with other choirs, as well as at festivals and at parties. See the About Us page to find out more about the choir. Raised Voices welcomes singers of all abilities. Raised Voices meets on Thursday evenings 7.30-9.30pm at the Doreen Bazell Community Centre in Chenies Place (off Pancras Road), London NW1 1UG. More information can be found on the Contact Us page. American Public Media podcast Marketplace reports on Raised Voices at the Put It To The People march. Watch Raised Voices perform at the 2016 Street Choir Festival, which was hosted by Red Leicester Choir in Leicester from 24–26 June 2016. We joined Extinction Rebellion for their International Rebellion Week starting Monday, 15 April. On Thursday, 18 April we sang at the south end of Waterloo Bridge. Raised Voices performed at an event at the Café Palestina—53 Fortess Rd., Kentish Town, NW5 1AD—on Saturday March 30th. We sang from our repertoire of songs about Palestine amidst a programme of speeches from Palestinian visitors, and other musical performances. 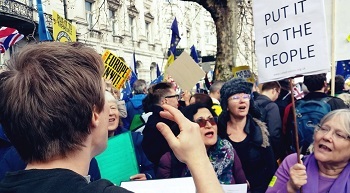 On Saturday 23rd of March, Raised Voices supported the Put it to the People march from Hyde Park to Parliament, organised by Open Britain to demand a final say on any Brexit deal. You can also listen to the American Public Media podcast Marketplace report on our singing at this demo. 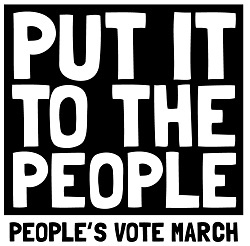 Put it to the People march on Sat, 23 March.